This tutorial series is intended for web developers who have heard about React but have little to no experience using it. There are a lot of articles on the Internet about the benefits of React-Redux, so I’m not going to re-state what has already been said. If you’re reading this article, then I assume you’re already convinced and ready to get your hands dirty. Part I of this tutorial series will walk-through the Redux flow of this app. By the end of this series you will have the confidence to create and a general purpose boilerplate to help you jumpstart your own projects. So let’s get started! First, clone the Github repo at https://github.com/kangzeroo/Kangzeroos-ES6-React-Redux-Boilerplate. Then enter the cloned folder and install the dependencies. Now open up the code in your favorite text editor. The boilerplate is heavily commented, so you could understand it eventually just by reading the comments. But for the sake of structure, direction, and time savings, let’s go through it together. Each one of these nodes represents a React component. Components could be a profile header, a tweet newsfeed, a form… you get the point. These components are “presentational”, aka “dumb” components. That means the code in the component deals only with presenting what the user sees. The data behind the components originate from the Redux Store, which can be thought of as a giant global variable. The data inside here is called the state of an app. 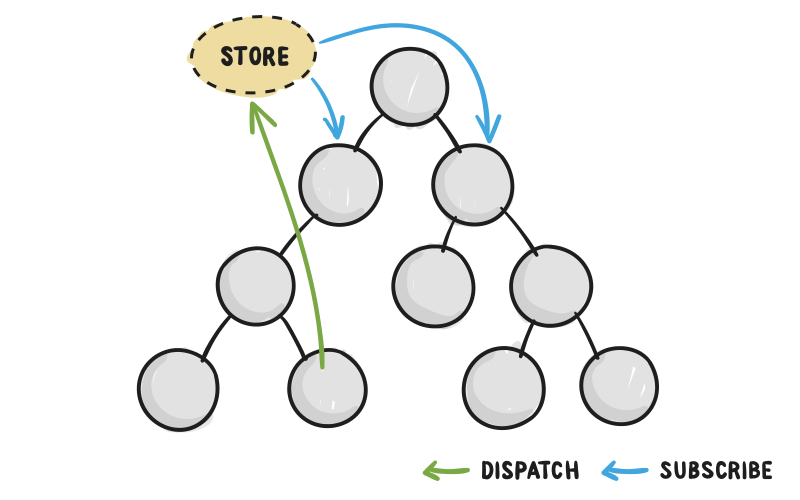 When a component wants to change some data, it will dispatch (explained later in this article) an action to the Redux Store, which determines the next state of the app based on logic we define. When the Redux Store is updated, any components that depend on the state will be updated to reflect the latest changes. What is important to take away from this is that components never talk directly to eachother. They all communicate with the Redux Store, which is the single grain of truth across the entire app. This leads to simpler state management, and thus allowing us to create apps of greater complexity. So let’s start off with the Redux Store. Go to ./App/src/reducers/contentReducer.js and take a look at const INITIAL_STATE. This variable represents our initial state, and we have defined only 1 property called myContent, which is an array. 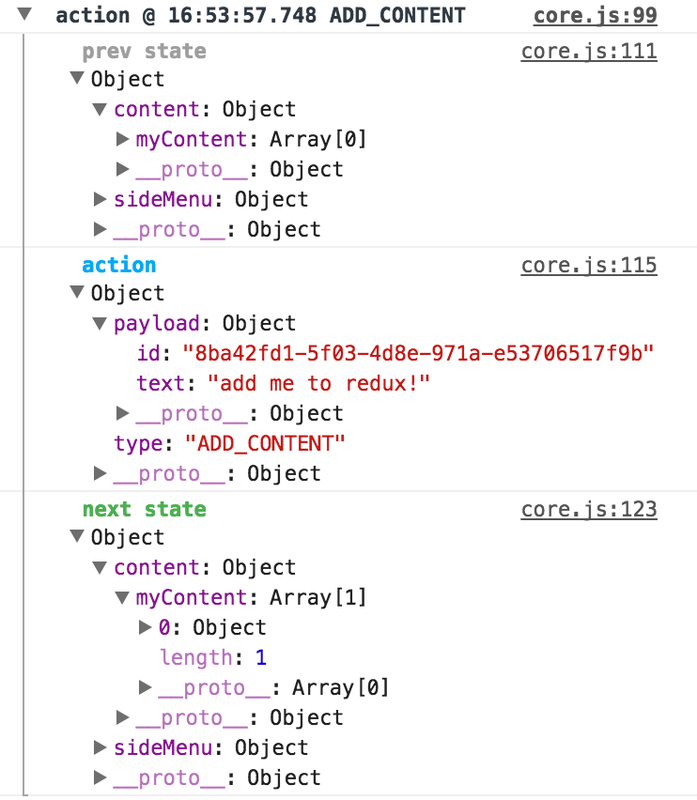 Our contentReducer.js is taking in these incoming actions and checking their type. In the case that type == ADD_CONTENT, we want to return the exact same state but with myContent slightly changed. According to our contentReducer logic, myContent will have the payload of the action appended to the array. After this state update is complete, we return the newly changed state object. But recall that ./App/src/components/home.js was watching the state.content.myContent variable. Because home.js cares about (aka is subscribing to) myContent, then whenever myContent changes, so will the home.js UI. That’s great because your UI will always be showing the correct latest information. We can see the previous Redux state, the action that was sent, and the resulting Redux state. Wow! We just went through the entire Redux state flow and its results. Perhaps this is walkthrough was enough to get you comfortable with this boilerplate. If so, great! But for everyone else, check out Part II to continue our exploration of this React-Redux Boilerplate where we explain the specifics of a React component.